We’ve known that these characters will be in the game for a while, but we can finally see what Ghost Rider, Firebrand, Jedah, and Dormammu are going to be doing in Marvel vs. Capcom: Infinite, and it all looks suitably silly. I mean, it takes place in a location called ‘The Dark Dimension’ – you can be sure there’s some comics-influenced absurdity going on. For some perhaps less silly things, here’s the best PC games of 2016. 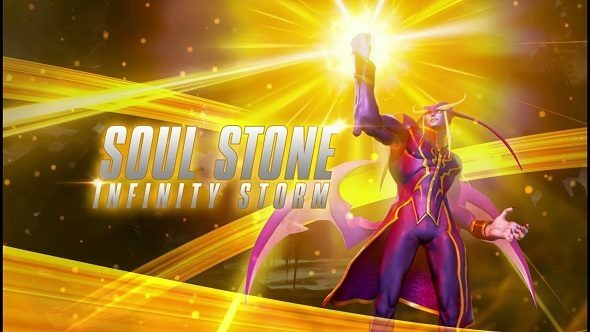 Now you can get an idea of what the movesets for each of those characters will be, as well as see one Infinity Stones that will be available in the game: the Soul Stone. The one on show offers two possibilities: to gain life steal, presumably healing yourself on attacks, and to revive a teammate. Sounds just a touch strong. In case you’re wondering why Ghost Rider is fighting Dormammu, a story trailer was released just a few days ago. The gist seems to be that Jedah (from Darkstalkers) and Ultron Sigma (Iron Man/Ant Man’s robot) are teaming up because they have two Infinity Stones, the good guys want to stop them, but also the good guys can’t actually decide on the best way to stop them so spend most of their time debating with the bad guys rather than actually fighting them. But also Dante and Mega Man are there. Games are wild.